For more than three years, a mum has been begging the Local Education Authority for help with her disabled son. Here she speaks to Laura Cooke about her struggle trying to get her son the support he deserves. 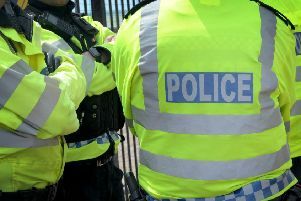 THE BOOMING sound of the police helicopter bounced off the rooftops of homes in Pebsham; the probing noses of police dogs sniffed at the undergrowth; patrol cars were parked on virtually every street corner, from Pebsham Lane to Ravenside. These were the scenes on Friday after seven-year-old Isaias Brewerton ran away shortly after arriving in the school grounds, sparking a major police hunt. Sadly, it is not the first time the youngster had fled while being dropped at St Mary Magdalene, his frustrated mother Jay, tells me. Isaias has autism, a lifelong, developmental disability, which affects how a person communicates with and relates to other people, and how they experience the world around them. He has two autistic conditions including a rare form of autism, PDA (Pathological Demand Avoidance Syndrome). Isaias gave Jay a black eye one morning as she tried to get him to school. When Isaias’ anxieties spiral out of control, he flees from the situation he finds difficult - in this case, attending his mainstream school. But it’s a situation that looks unlikely to change any time soon as Jay has been embroiled in a bitter three-year battle with the Local Education Authority (LEA) to move her son to a school better suited to his needs. Jay explained: “Isaias got his diagnosis at 17 months. “We had the PDA diagnosed when he was five-and-a-half. Bexhill and Battle MP Huw Merriman has agreed to take up Jay's case. “We were offered a place at Torfield School in Hastings (for special educational needs and disabilities) which we declined - very naively, looking back. “We went to visit there nine times and we discussed it and fought to get him into mainstream. “But the Early Year’s Services said he would be going in with a statement [of special educational needs]. “Only in September 2013 we become a pilot area for the government for the new Education, Health and Care Plan (EHCP). The EHCP, which was supposed to help Isaias get the support he needed in his education, never materialised, despite repeated requests from Jay, her barrister and the school. Meanwhile it was becoming clear that Isaias was not coping in mainstream education as Jay had hoped, and his behaviour was starting to deteriorate. She said: “The expectation from the LEA is at four-and-a-half-years-old the problems go away when they go to school. It doesn’t. Jay added: “Isaias started running from school just over two years ago. “It’s usually just as we are arriving at school. “If he was younger, I could put him on leads and reins, but he’s at an age he can unclip everything. In the grip of powerful anxiety, Isaias loses his sense of danger and has previously run out into the path of traffic. And when faced with nature’s ‘fight or flight’ response, worryingly, Isaias can also respond with the former. Jay said: “He kicks, he bites, he punches, anything he can to run away. It sounds like he’s a horrible child. “He regularly injures his siblings, trying to run, and I had my foot in a cast because he gave me three fractures in my foot stamping on it to get away while I was trying to restrain him. She explained: “It’s the PDA element of the autism. Jay stressed that Isaias has never been violent or aggressive at school, coping instead by ‘shutting down’. In January last year, Isaias began to make threats to kill himself because he does not want to go to school. He was referred to the Child and Adolescent Mental Health Service (CAMHS). Yet despite Isaias’ escalating behaviour, East Sussex County Council maintains he does not need an EHCP, much to Jay’s frustration. But another arm of the council, social services, has been involved with the family recently due to the level of injuries the siblings have sustained, and has even threatened to remove Isaias’s brother and sister from Jay’s care, over his violence and aggression towards them. She said: “I have had social services out five times. The cost of temporary foster care for his siblings would run into well over a hundred thousand pounds for a year, yet I can not even get assistance for one hour a day to help Isaias transition into school from the same authority budget? Jay has two other young children and on one occasion when Isaias fled the school grounds, she left them in the car on the premises to chase after Isaias - only to be reported to social services again. She said: “Social services say it is abandonment and neglect if I leave the other two children to chase him. As Jay’s seemingly never-ending battle with the LEA continues, she says the only alternative option which has been put to her was home schooling. She said: “They said possibly the best thing you can do is take him out of school. Jay added: “I do lots of educational and creative things with Isaias at home. Jay said: “We wanted him in mainstream education as we believed with his disability diagnosis, he would automatically receive help. “We never believed nearly four years down the line we would be in a position of still begging the LEA to help support him so as an autistic child he can cope in his school environment. Last year Mr Merriman pledged his support to Ambitious About Autism’s ‘When will we learn?’ campaign, which aims to make the education system better for children and young people with autism. Mr Merriman MP told the Observer he has taken up Jay’s case. He said: “I spent 90 minutes with Ms Brewerton a fortnight ago and heard about the difficulties which she had faced getting the correct level of support for her son. “I will now be seeking the response of the authorities involved and I have taken up her case. “I am, separately, leading a national inquiry in Parliament on behalf of the All Party Parliamentary Group for Autism, of which I am an officer, to investigate school access and funding for children with autism. Yet another application for an EHCP has been lodged with the LEA and once again Isaias’ future is in the council’s hands. An East Sussex County Council spokesman said: “The vast majority of children with special educational needs attend their local mainstream school and make good progress without the need for an Education, Health and Care Plan (EHCP), previously known as a Statement of Educational Need (SEN). “In this case, we did receive an application for an EHCP in September, but unfortunately we didn’t have all the information we needed to carry out an assessment at that time. “We have now received a fresh application, an assessment into whether an EHCP is required is currently being carried out and we expect this to be referred back to the multi-agency Special Educational Needs Statutory Assessment Panel for a decision very shortly. “No decision as to the appropriateness of mainstream schooling would be made by the local authority until the conclusion of this process. He added: “Resources for provision of EHCPs and special school places do not come from council budgets but are provided to the county council by the Department for Education. The assessment process for EHCPs is set out in statutory guidance. “We cannot comment further on individual cases. Jay hopes her tale will act as a warning to other parents of children with special needs to get their needs sorted before they start school. She said: “My barrister said I would have more success setting up my own school rather then getting Isaias in a specialist school. She added: “You listen to people’s stories about their experiences with EHCP and you think how can these parents be so neglected by the local authority? You have got parents who are depressed, suicidal, that have had to give up jobs to home school.